The high concentration of sugar in the blood damages the nerve cells, particularly those of the peripheral nerves. Neuropathy is one of the most frequent complications among diabetics and can lead to the loss of sensitivity especially in lower limbs and to the Diabetic Foot. In addition, the painful symptoms which are often accompanied by itching, burning, tingling and numbness can considerably worsen the quality of life. 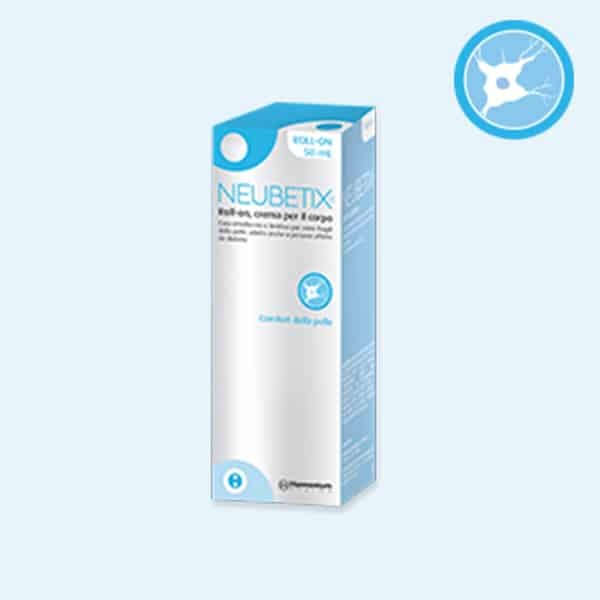 NeuBetix Roll-on helps relieving the skin discomfort associated with neuropathy. Due to its high moisturizing power, NeuBetix Roll-on helps in case of pain and gives instant relief and freshness. The massaging effect of the applicator ball produces a draining action on the affected limbs. Apply two to three times a day on the affected area, by sliding the applicator on it. The pharmacology of topical analgesics. – Barkin RL. Postgrad Med. 2013, Jul;125(4 Suppl 1):7-18. Essential oils of camphor tree (Cinnamomum camphora Nees & Eberm) cultivated in Southern Brazil. – Frizzo CD, et al., Braz Arch Biol Technol 2000; 43 (3): 13-316. In vitro anti-inflammatory and anti-oxidative effects of Cinnamomum camphora extracts – Lee HJ, Hyun EA, Yoon WJ, Kim BH, Rhee MH, Kang HK J thnopharmacol 2006; 103 (2): 208-16. Capsaicinoids in the treatment of neuropathic pain: a review. – Peppin JF1, Pappagallo M2., Ther Adv Neurol Disord. 2014 Jan;7(1):22-32. Menthol: a simple monoterpene with remarkable biological properties. – Kamatou GP1, Vermaak I, Viljoen AM, Lawrence BM., Phytochemistry. 2013 Dec;96:15-25.